This article provides in-depth fundamental analysis of Bhageria Industries Ltd, an Indian player dealing in dyes & intermediaries and solar power projects. Here I present a report on Bhageria Industries Ltd. Please give your valuable inputs. I express heartfelt thanks for all the work that you are doing. Bhageria Industries Ltd, established in 1989 with an objective to serve the dyes & intermediates industry all over the globe. The company commenced its operations by setting up a Vinyl Sulphone Plant at Vapi (Gujarat) with a capacity of 540 T.P.A. which has now expanded to 3600 T.P.A. Subsequently Company has gone for further expansion in other Dyes intermediates & Dyestuffs. Nearly 70% of its production is being exported worldwide to various clients including multinationals. Manufacturing and exporting of Dyes and intermediates. Sourcing and exporting various pharmaceutical products (APIs and FFs). Sourcing of various Bulk chemicals. 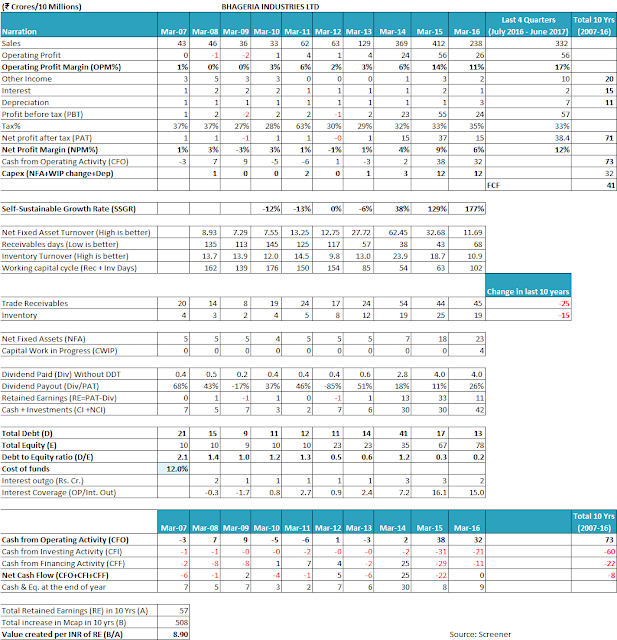 Here PE Ratio is slightly higher than MOS. PEG ratio means growth adjusted earning is less than 1 that suggests the stock is undervalued. EY is greater than govt. interest rate. P/B ratio is worse (As notified by you, P/B ratio irrelevant for sectors other than financial services). Bhageria Industries Ltd has been growing at an average rate of about 21% per annum for last 10 years, with average 6% NPM from last three years. From the year 2007, Co. is regularly paying out tax with more than 27% that glimpse about management quality. Bhageria Industries Ltd has a very good interest coverage 52 times in recent years that also means that Co. has sufficient interest coverage to paying out its interest. Company’s current assets are 60% more to take care of its current liabilities. 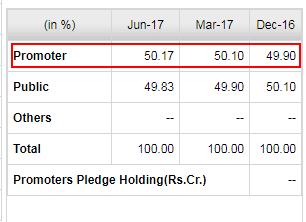 Bhageria industries Ltd is growing at decent sales growth of 21.09% in last 10 years with average NPM of 6% since 2014. In current year sales is decreased to 57.77% compared to previous year. Co. stated in the annual report that it is due to prize and realization remained quite lower compared to previous year. Inventory turnover ratio is stable between 10 – 13% till 2013 and after 2014 it is continually declining. Declining of inventory turnover ratio is becoming a major question for a company. Receivable days are declining till 2014 and after it is increasing, which shows that Bhageria Industries Ltd is not able to realize its dues from customers in recent time. NFAT Ratio is continually increasing since 2009 and it is decreasing from 2014. Overall three ratios are fluctuating and decreasing in recent years. I want your view on these ratios. Debt to equity is decreasing since 2015 that means the company is maintaining its debt level. Bhageria Industries Ltd has PAT for last 10 years of ₹44 cr. whereas the CFO over the similar period is ₹73cr. PAT has nearly been converted into CFO. There does not seem to be much concern on this parameter. Bhageria Industries Ltd has an SSGR of about 38-177% from the last three years, which is more than the sales growth rate of 21-31% being achieved by the company in the past, which suggests they can keep on growing without raising debt. Mr. Suresh Bhageria is a chairperson and promoter of Bhageria Industries Ltd. with a qualification of B. Com. and more than 25 years of experience. Current year promoter salary is 15.56% compared to net profit and it is decreasing as net profit decrease. Bhageria Industries Ltd is regularly providing a dividend. The Current dividend payout ratio is 25.96%. Bhageria Industries Ltd show sales growth higher than peers except for Jindal poly films, which does not indicate Moat of the BIL. Bhageria Industries Ltd has setup a Solar Power Plant at Capital Cost of Rs. 19 Cr. to reduce the cost of power. 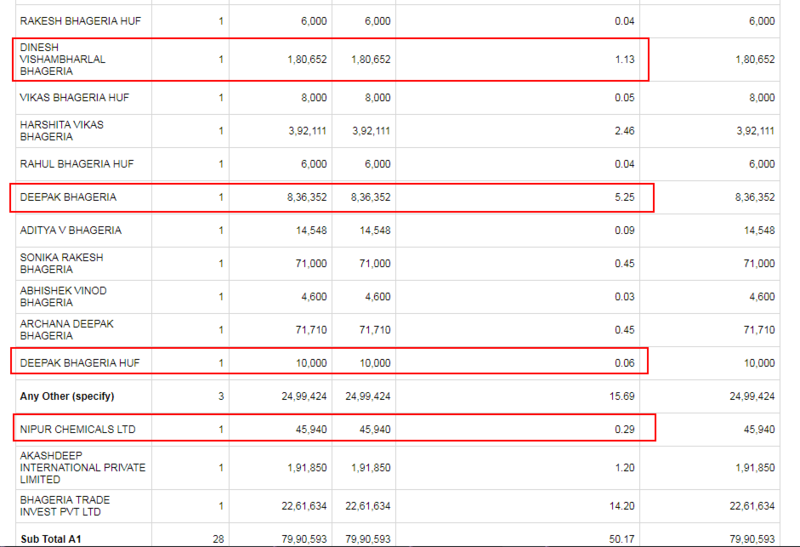 In the current financial year, Bhageria Industries Ltd used Rs. 81.41 Lakhs and 47 Lakhs in the previous year as CSR activity, which suggests company’s socially responsible value. Thanks for sharing the analysis of Bhageria Industries Ltd with us! We appreciate the hard work put in by you in the analysis. Let us first try to analyse the financial performance of Bhageria Industries Ltd over last 10 years. Bhageria Industries Ltd has been growing its sales since last 10 years (FY2007-16) at a rate of 20% year on year from ₹43 cr. in FY2007 to ₹238 cr. in FY2016. The sales have further increased to ₹344 cr. in FY2017. This sales growth journey has been quite turbulent for Bhageria Industries Ltd and it has witnessed sales decline in FY2010 and FY2016. The sales revenue reached the highs of ₹412 cr. in FY2015 and the company is yet to achieve those levels. Just like fluctuations in the sales growth, Bhageria Industries Ltd has witnessed the profitability margins vary significantly over the years. The company reported operating losses in FY2008 and FY2009 and had very low amounts of operating profits until FY2013. Thereafter, the operating profit margin (OPM) has improved but still, the OPM has shown very high fluctuations from 6% to 17%. Such fluctuating pattern of OPM indicates that Bhageria Industries Ltd does not have a pricing power over its customers and is not able to timely pass on the raw material price increases to its customers. As a result, when the raw material prices increase, Bhageria Industries Ltd has to take a hit on its profitability margins. Such cyclical pattern of operating profitability margins is predominantly prevalent in companies that deal with products, which are commoditised and the customers have an option of buying the products from a number suppliers. The net profit margins (NPM) of the company have been following the trend of operating margins over the years. The company barely had any net profits until FY2013 where it reported net losses in FY2009 and FY2012. Since then the company has been reporting consistent profits, however, the NPM has been fluctuating from 4% to 12%. The tax payout ratio of Bhageria Industries Ltd seems to be in line with the standard corporate tax rate prevalent in India. Over the years, the tax payout is in the range of 28% to 33%. While assessing the net fixed asset turnover (NFAT) for Bhageria Industries Ltd, an investor would notice that the NFAT levels of the company are consistently on very high levels of more than 10 and at one point in time in FY2014, it had reached 62 times. Such high levels of NFAT are usually seen in companies, which do not need to invest a lot in their plant and machinery or those who rely on outsourcing of the manufacturing process and in turn primarily act as trading companies. The companies, which are not into trading of goods and enjoy such high fixed assets turnover on account of low capital intensiveness of their operations face a lot of competition from unorganized sector unless their market is protected by intangible factors like brands or patents. In the case of Bhageria Industries Ltd, an investor would notice that the company deals in dyes and dye intermediates, which are commodity chemicals. High fixed asset turnover in commodity chemicals space indicates that a lot of competitors can start manufacturing the same product with Ltd investment and in turn pose a risk to the market of the company in case it tries to increase its product prices. Therefore, it won’t come as a surprise to the investor that Bhageria Industries Ltd has witnessed fluctuating profitability margins as it is not able to pass on the increases in the raw material costs to its customers on account of such competition. Moreover, the company also deals in trading of goods like pharmaceutical products, agrochemicals and pigments etc. The trading component of the business though has very low margins but increases the NFAT to very high levels. In last a few years, the company has entered into solar power generation, which is a capital intensive business and as a result, the NFAT of the company might reduce further going ahead. When an investor analyses the receivables days of Bhageria Industries Ltd, then the investor would notice that the receivables days of the company used to be very high until FY2012 in the range of about 120 days. However, since then, the company seems to have put in efforts to improve its collection practices and has brought down the receivables days significantly to 38 days in FY2014. An investor would notice that the receivables days have again started to increase and have reached 68 days in FY2016 and about 50 days in FY2017. It is advised that the investor should keep a close watch on the receivables days of Bhageria Industries Ltd going ahead to monitor whether the working capital efficiency of the company is deteriorating in future. Looking at the inventory turnover ratio (ITR) of Bhageria Industries Ltd, an investor would notice that ITR has been fluctuating wildly over the years in the past. The company has had an ITR of as low as 9.8 in FY2012 and as high as 23.9 in FY2014. Such wide variations in the ITR indicate that the company is not able to plan its inventory levels, which further seems to indicate that the company might not be able to reliably gauze the demand of its products in the market. This is further substantiated by the explanations given by the management for decline in sales in FY2016 (discussed above) that the demand for the company’s products witnessed a slowdown in the year, whereas, at the start of FY2016 (i.e. at the end of FY2015), the company has kept the highest level of inventories. The investor would notice that Bhageria Industries Ltd has witnessed an SSGR ranging from negative rates to 177% in FY2016. The key reasons for such wide fluctuations in the SSGR for the company are significant variations in the NFAT and the NPM for the company during FY2012 to FY2016 (the SSGR formula used by us takes 3 years rolling average of the input parameters). The fluctuations in the NFAT, as well as NPM, have been discussed above including the impact of trading business segment and the commodity nature of products and the conclusions of both the parameters indicate that it is very difficult to assess the business of Bhageria Industries Ltd on a steady state basis. This seems true as even the management has found it difficult to assess the product demand, working capital requirement etc. in the past. Upon reading the SSGR article, an investor would appreciate that if a company is growing at a rate equal to or less than the SSGR and it is able to convert its profits into cash flow from operations, then it would be able to fund its growth from its internal resources without the need of external sources of funds. However, the uncertainties in the business like in the case of Bhageria Industries Ltd make the interpretation of the SSGR parameters difficult. However, still, it can be witnessed that currently, the SSGR is higher than the achieved sales growth of the company and it can also be observed that the company has been able to reduce its debt from ₹21 cr. in FY2007 to ₹13 cr. in FY2016. Moreover, the investor would also notice that the company has investments of worth ₹42 cr. in FY2016 and therefore the company has a net debt of zero at FY2016. We will further discuss this aspect of Bhageria Industries Ltd later in the article. The debt free assessment of Bhageria Industries Ltd up to FY2016 gets substantiated when the investor analyses the free cash flow position of Bhageria Industries Ltd.
Over FY2007-16, Bhageria Industries Ltd has witnessed its sales increase from ₹43 cr. in FY2007 to ₹238 cr. in FY2016. For achieving this sales growth the company has done an additional capital expenditure (capex) of ₹32 cr. However, Bhageria Industries Ltd has generated a cash flow from operations (CFO) of ₹73 cr. over FY2007-16 leading to a surplus of ₹41 cr. 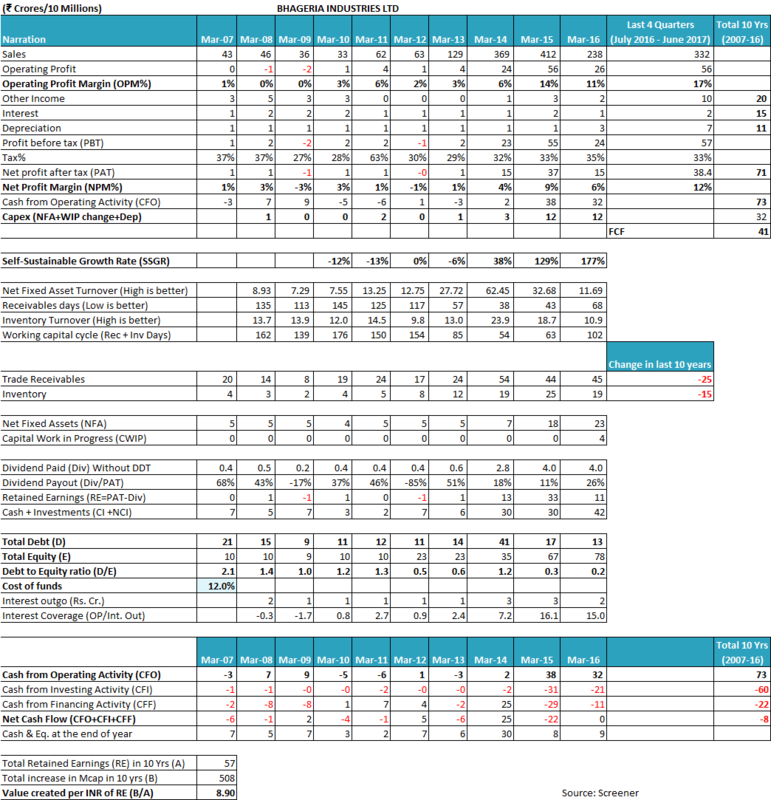 as free cash flow (FCF) to its shareholders. Bhageria Industries Ltd seems to have utilized the resulting free cash flow (FCF) of ₹41 cr. to reduce its debt from ₹21 cr. in FY2007 to ₹13 cr. in FY2016, pay interest expense of ₹15 cr. 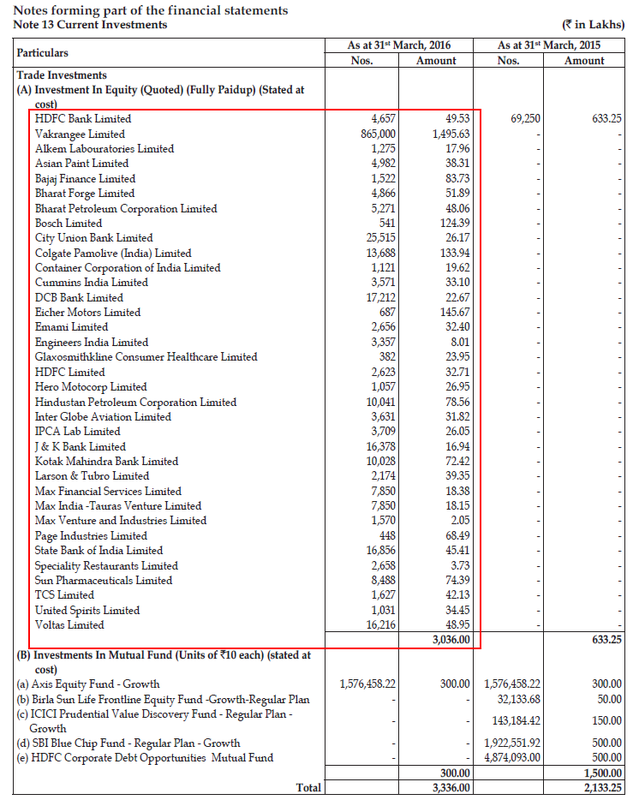 over FY2007-16 and to pay dividends of about ₹14 cr to equity shareholders. The key management of Bhageria Industries Ltd constitutes of Mr. Suresh Bhageria, Mr. Vinod Bhageria and Mr. Vikas Bhageria. Mr. Vikas Bhageria, currently 37 years of age, is the son of Mr. Suresh Bhageria. An investor would notice that the promoters of Bhageria Industries Ltd are steadily increasing their shareholding in the company. As per BSE website, the promoters have increased their shareholding in the company by 0.27% over last 2 quarters and now hold more than 50% shares in the company. 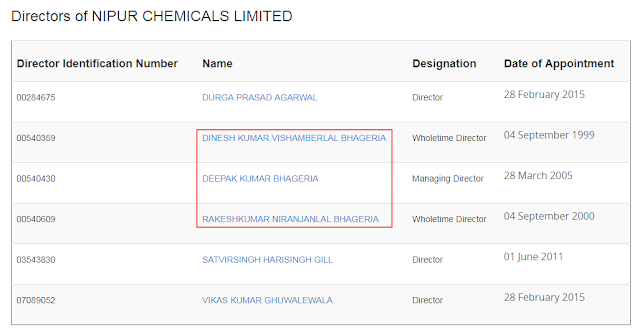 Bhageria Industries Ltd is currently in the process of merging one of the promoter group entity Nipur Chemicals Ltd, which is in a similar line of business, into itself in an all share deal. 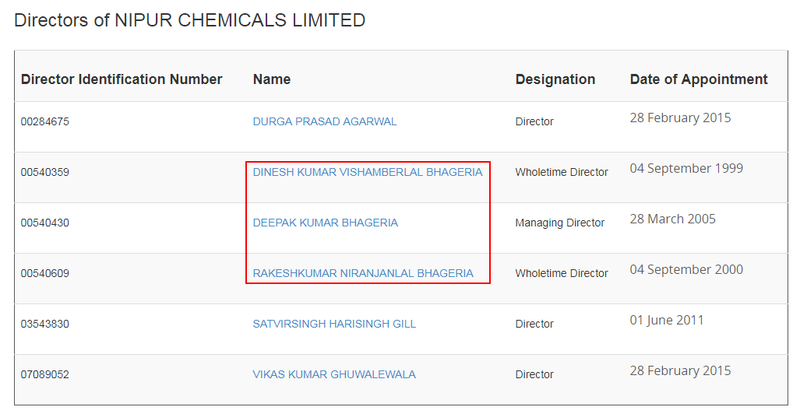 All share deal means that instead of cash, Bhageria Industries Ltd will pay to the shareholders of Nipur Chemicals Ltd by way of shares of Bhageria Industries Ltd.
As per the corporate database website, Zauba Corp, the key management positions of Managing Director and Whole Time Directors are held by Mr. Deepak Bhageria, Mr. Dinesh Bhageria and Mr. Rakesh Bhageria respectively. 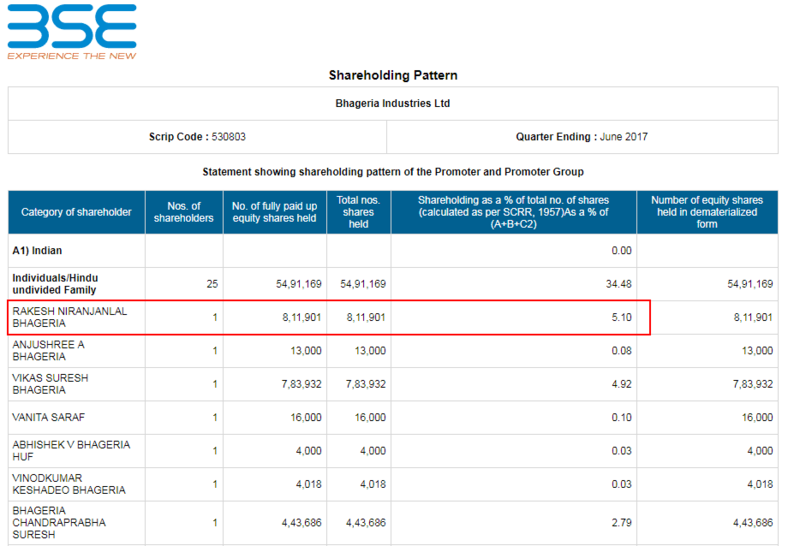 As per the shareholding pattern of Bhageria Industries Ltd shared above and another image below, Mr. Deepak Bhageria, Mr. Dinesh Bhageria and Mr. Rakesh Bhageria hold 5.25%, 1.13% and 5.10% stake in the company respectively and have been classified as promoters of Bhageria Industries Ltd. 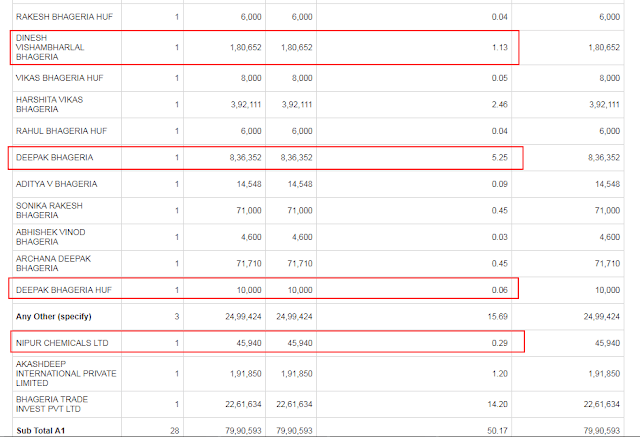 They also hold additional shares in the names of their respective HUFs (Hindu Undivided Family). 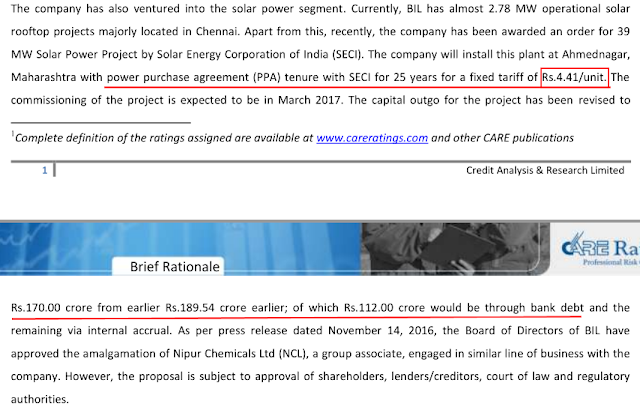 Moreover, credit rating agency CARE Ltd in its report of Nov 2016 has mentioned Nipur Chemicals Ltd as a group associate of Bhageria Industries Ltd. Therefore, an investor would appreciate that Bhageria Industries Ltd is proposing to effectively purchase a promoter group entity by making payment by way of shares of Bhageria Industries Ltd. The effective value of consideration proposed to be paid (i.e. the value of shared of Bhageria Industries Ltd proposed to be given to shareholders of Nipur Chemicals Ltd comes to be about ₹229.11 cr. based on closing price of Bhageria Industries Ltd shares (₹385.55) on BSE on November 11, 2016, which is the available reference price on November 14, 2016, when the board of Bhageria Industries Ltd approved the Scheme of Amalgamation. (November 14, 2016, was a trading holiday on account of Gurunanak Jayanti). 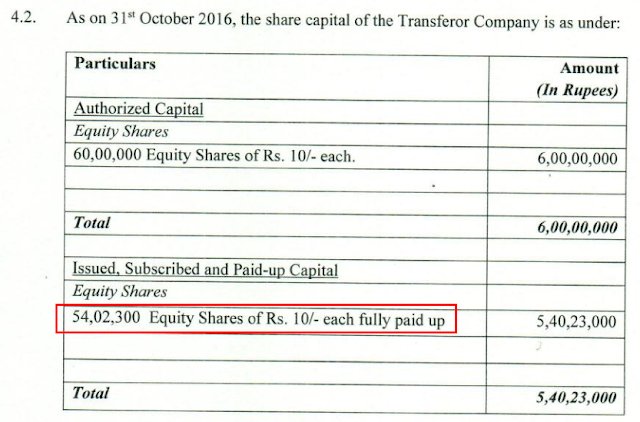 As per page 11 of the Scheme of Amalgamation document available at the website of Bhageria Industries Ltd, the consideration to be paid to shareholders of Nipur Chemicals Ltd is 11 shares of Bhageria Industries Ltd for each 10 shares of Nipur Chemicals Ltd held by its shareholders. As per page 3 of the Scheme of Amalgamation document, Nipur Chemicals Ltd has 5,402,300 shares. 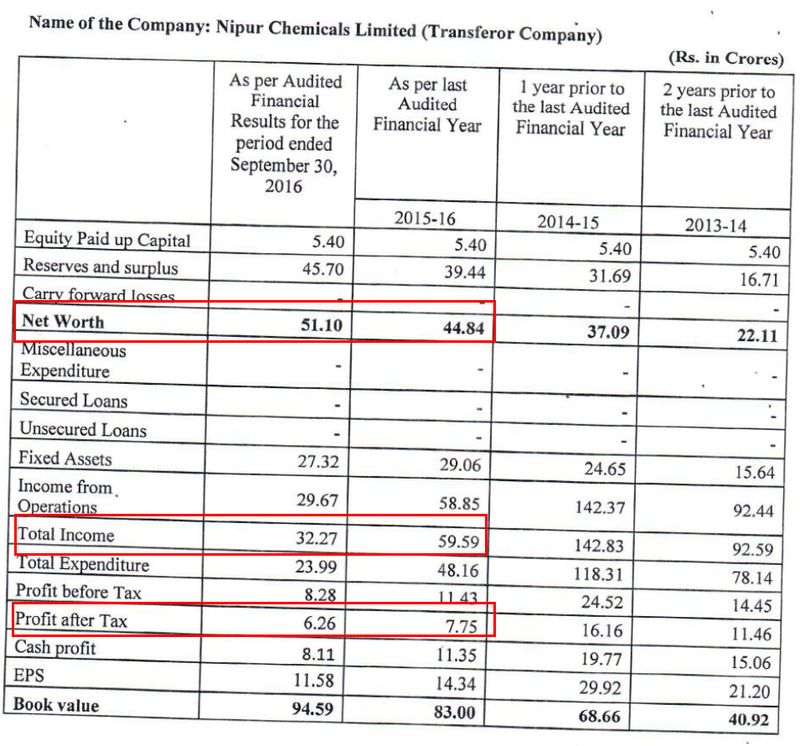 Therefore, the total number of shares of Bhageria Industries Ltd to be paid/given to Nipur Chemicals Ltd would be 5,942,530 (= 11 * 5,402,300 / 10). The value of 5,942,530 shares of Bhageria Industries Ltd at the closing price of November 11, 2016, at BSE (₹385.55) comes out to be ₹229.11 cr. Sales of ₹59.59 cr. in FY2016 and annualized sales of ₹64.54 cr. in FY2017 (i.e. double of H1-FY2017 sales of ₹32.27 cr). Net profit of ₹7.75 cr. in FY2016 and annualized net profit of ₹12.52 cr. in FY2017 (i.e. double of H1-FY2017 profit of ₹6.26 cr). The net worth of ₹44.84 cr. at March 31, 2016, and ₹51.10 cr. at Sept 30, 2016. The above approach will provide an investor with a perspective of the consideration being paid by Bhageria Industries Ltd to merge/acquire the business of Nipur Chemicals Ltd. The price of Bhageria Industries Ltd has witnessed a decline of about 12% in one day from ₹321.70 at July 28, 2017 (Friday) to ₹283.90 on July 31, 2017 (Monday). We are able to find only one news/corporate announcement at BSE from the company after the market hours of July 28, 2017, which is related to seeking deferment of AGM for 2017 by 3 months due to the impending amalgamation. An investor may wish to search for any other related development that might have led to this significant decline in the share price in one day. As per the BSE filing done by Bhageria Industries Ltd on July 19, 2017, the company has commissioned the 30 MW solar power plant in Ahmednagar district, Maharashtra on June 17, 2017. As per the credit rating rationale by CARE, the solar power plant has a power purchase agreement (PPA) for 25 years at ₹4.41 per unit. There is another critical information available in the rating rationale that the cost of the project has declined from about ₹190 cr. to ₹170 cr. 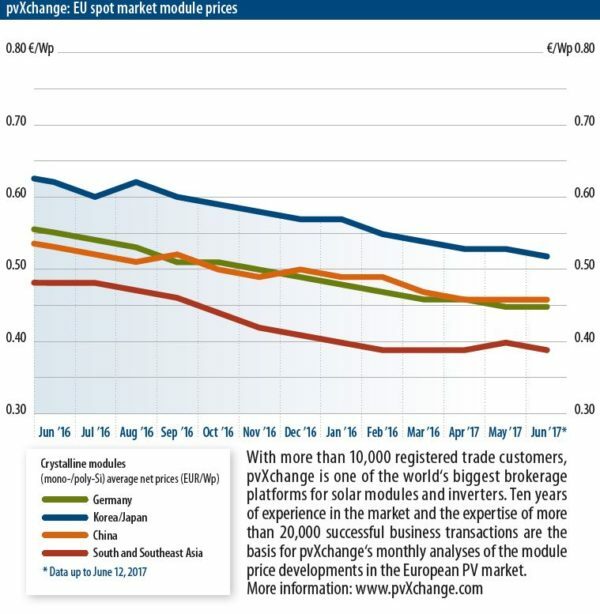 As per the above chart, the solar module prices for South and South East Asia have declined from EUR 0.48 per watt-peak in June 2016 to EUR 0.38 per watt-peak, which is a 20% decline in costs in one year. As the cost of solar modules is one of the biggest cost in the solar power project, there is no wonder that the cost of the solar power plant for Bhageria Industries Ltd also declined from ₹190 cr. to ₹170 cr. 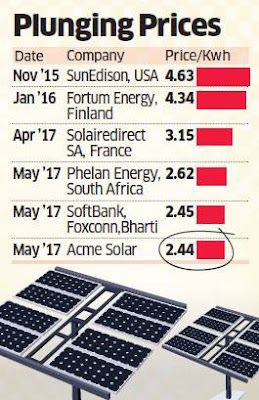 There has been a very sharp decline of about 45% in the solar power tariffs (from ₹4.41 per unit to ₹2.44 per unit) after the power purchase agreement (PPA) was signed by Bhageria Industries Ltd for its solar power plant with Solar Energy Corporation of India. If an investor takes a common logical approach, then it looks difficult that any purchaser will keep on paying a higher price for power, which in this case is 80% higher than the current market price (4.41 / 2.44), for next 25 years. We believe that there is very high probability that such power purchase agreements (PPA) which have tariffs higher than market price will be reneged or renegotiated at lower levels. There is already news in the media that some power utility companies are now hesitating to sign the PPA for projects, which were allotted at higher tariffs. There is also news in the media that some power utility companies are not buying power from such high tariff plants despite PPAs being in place. A rational buyer will always look for ways to reduce the cost of purchase. It is normal behavior and is present across industries. “NEW DELHI, DEC 31: Petronet LNG, India’s largest LNG importer, will ring in the new year with good news. The company will get fuel from Qatar’s State-owned gas producer RasGas at nearly half the cost originally agreed upon. It will also not have to pay the ₹12,000-crore penalty for lower off-take in 2015. On Thursday, RasGas and Petronet signed a revised sale purchase agreement, according to which, Petronet will get LNG at $6-7 per million British thermal unit (mBtu). Under the original contract signed between the two companies in 1999, Petronet would get LNG at $12-13 per mBtu. Supplies began in April 2004. The new contract is effective January 1, 2016, and ends in 2028. 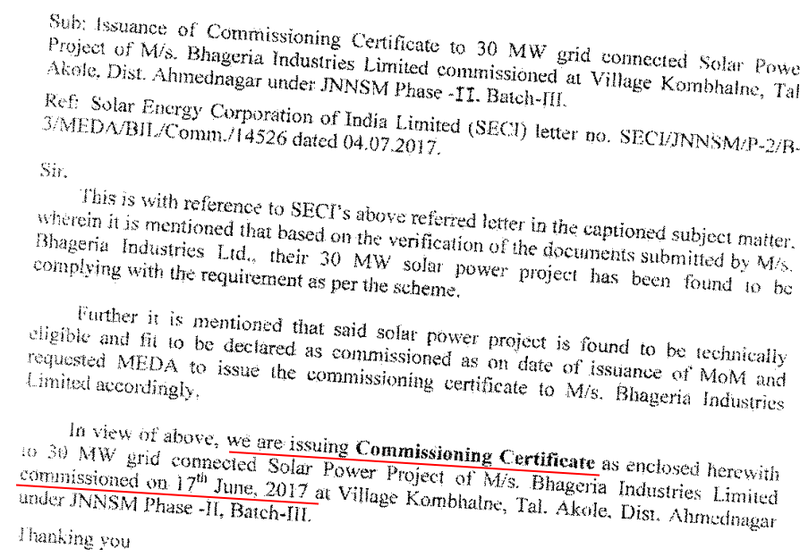 As a result, an investor would appreciate that if the market price of solar power tariff continues to fall further or even if it stays at current levels of ₹2.44 per unit and does not increase, then there is a probability that Bhageria Industries Ltd might have to face similar situation of tariff renegotiation or lower purchase of power by utility companies. This is because hardly any rational buyer will keep on paying an 80% higher price (4.41 / 2.44) for 25 years. As witnessed above, such contracts have been renegotiated in the past and they might also be renegotiated in the future. Any reduction in the solar power tariff would lead to the reduction in the returns anticipated by Bhageria Industries Ltd from the solar power plant. The investment by Bhageria Industries Ltd in the solar power project of ₹170 cr, which is primarily debt funded, is significant when compared to the overall net worth of the company of about ₹110 cr. at March 31, 2017. Therefore, any impact on the potential tariffs/returns would not be good for the company and the shareholders. It is therefore advised that investors should keep a close watch on the developments related to the power purchase levels from the company’s solar power plant by utility companies and also the indications of renegotiation of power tariffs in future. Bhageria Industries Ltd has been deploying cash in the stock markets and seems to be taking short term bets. While analysing the current investments of about ₹33 cr. 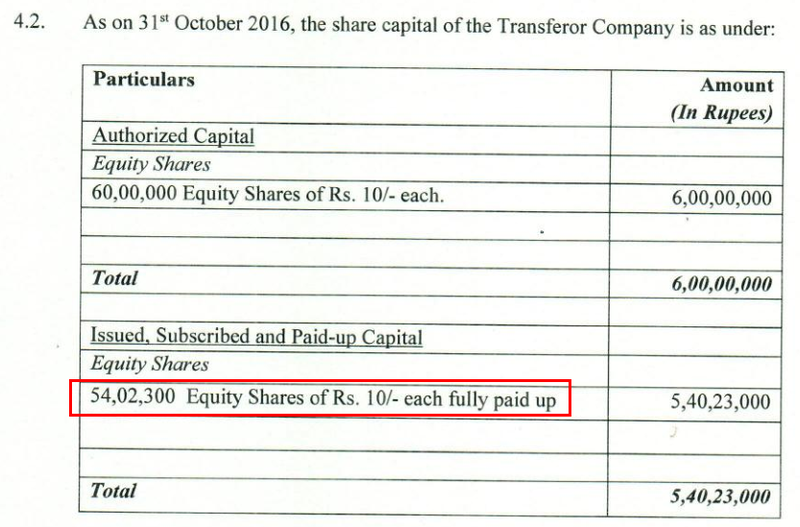 at March 31, 2016 (annual report FY2016, page 58), an investor would notice that almost entire ₹33 cr. is invested in equities. ₹30 cr. has been invested directly in shares of about 35 different companies whereas ₹3 cr. is invested in Axis Equity Fund, which is also an equity exposure. Managing a portfolio of ₹33 cr. and containing 35 stocks is a specialised function and might require dedicated professionals. The investor would notice that the amount of equity investments exceeds the operating assets (NFA+CWIP) at March 31, 2016, which stand at ₹27 cr. and it looks like the company has diversified from its core business of making dyes and intermediaries into solar power and equity investing. Moreover, an investor would also notice that Bhageria Industries Ltd has been taking short term bets in equity markets. An investor would witness it while analysing the cash flow statement of annual report FY2016, page 49, which contains items of “Short term Capital gain on sales of shares” for both FY2015 and FY2016. It is advised that an investor should keep a close watch on the current investments portfolio of Bhageria Industries Ltd and monitor whether the company continues to deal in short term equity transactions. It is important because the equity investments may decline 50% in value in any year without any change in underlying fundamentals of the underlying companies. If the person responsible for current investments at Bhageria Industries Ltd is not able to manage equity investments properly, then the resulting losses may eat up the earnings of the business of dyes & intermediates. Currently, Bhageria Industries Ltd is available at a price to earnings (P/E) ratio of about 12 (based on FY2017 earnings), which offers some margin of safety in the purchase price as described by Benjamin Graham in his book The Intelligent Investor. Overall, Bhageria Industries Ltd seems to be a company operating in a very competitive and tough business where it does not have the pricing power in its hand over its customer. The company is not able to pass on the raw material pricing increases to its customers and as a result, has been facing fluctuating profitability margins over the years to the extent of reporting losses as well. The dyes business of Bhageria Industries Ltd has proved to be highly unpredictable and as a result, the company seems to have faced challenges in estimating the demand for its products leading to sharp decline in revenue in a few years along with suboptimal inventory management. The company has currently entered into solar power production. However, the final returns, which Bhageria Industries Ltd will be able to make from solar power business are uncertain due to the fast changing business & pricing dynamics of the solar power industry. The company is currently undertaking merger of a promoter group entity, which operates in the similar line of business. An investor may need to analyse the merger transaction in depth. The company has been keeping its funds into equity investments and seems to have been taking short term positions, which is not the core function of a manufacturing company. An investor should keep a close watch on the current investments portfolio of the company. Company’s promoters have been increasing stake in the company in recent times and have brought in the next generation of the family in the business, which seems like the management succession plan. These are our views about Bhageria Industries Ltd. However, you should do your own analysis before taking any investment related decision about Bhageria Industries Ltd.